After beginning four years ago, BC Take Home Naloxone program continues to grow and save lives. To date, we've had 1880 reports of naloxone uses and overdose reversals, 10,785 people trained, and 12,395 kits distributed at 284 locations. 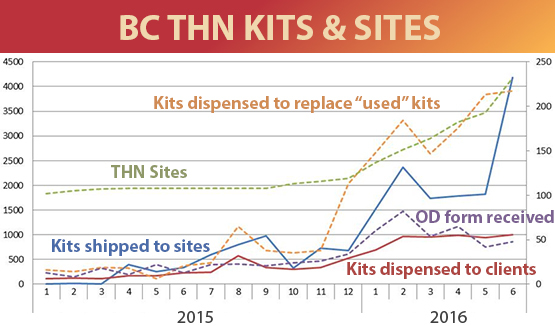 The BC THN program has been providing training and distributing kits in all of BC’s health authorities since August 31, 2012. In March 2015, an evaluation reviewed data collected regarding training, prescribing and dispensing, forms completed after naloxone was given, and clients’ reports of the benefit and challenges. The number of naloxone kits shipped to sites per month has increased to a peak of over 4,000 kits in June 2016. Naloxone was administered through the THN program in all regions of BC, with the largest numbers in Vancouver (34%) and Surrey (19%). Continue providing 3 naloxone ampoules per kit as the reported number used per overdose has increased alongside increases in fentanyl detection. 72% of reported naloxone administrations resulted in no or mild withdrawal symptoms, with 9% reporting severe withdrawal. Emphasizing the importance of calling 911 appears to be working as rates have increased over time though they vary by health authority. Fear of police attendance continues to be a major barrier to calling 911 with rates lower when overdoses take place in private residences (46%) versus in the street (81%). 13% of reports describe harassment by first responders. All emergency responders should be able to administer naloxone. We have a new form so sites can update personnel details or advise the THN program of changes. We have also changed reporting requirements so that sites are no longer required to provide training records for clients receiving kits. Predictors of seeking emergency medical help during overdose events in a provincial naloxone distribution program: a retrospective analysis. Qualitative assessment of take-home-naloxone program participant and law enforcement interactions in British Columbia. Johnson C, Buxton J, Harrison S, Ahamad K, Nolan S, Lappalainen L, Mead A, McLean M, Wood E.
Implementing a provincial take home naloxone program: Quantitative and qualitative evidence from a cross-sectional study in British Columbia, Canada. 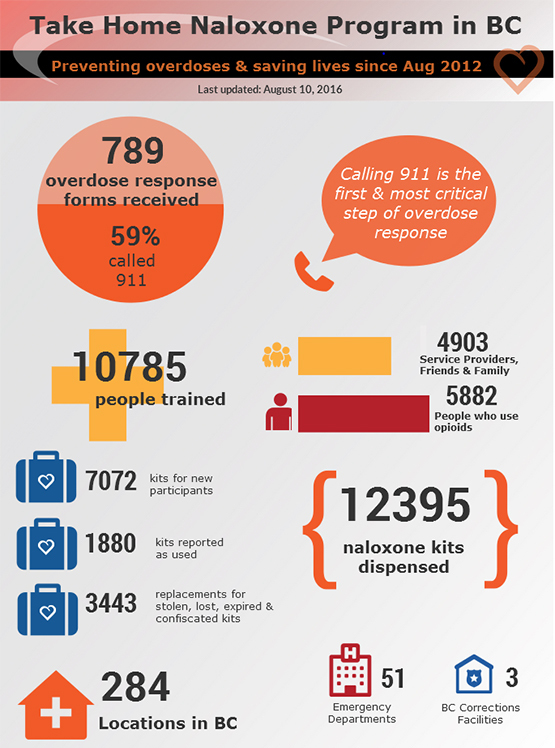 Calling 911 is an important first step in responding to an overdose yet it is often not taken. To help determine why, we conducted two studies to evaluate barriers and found the main reason was a concern about being arrested.